Guar seed and Guar gum price are down but Crude oil is moving toward USD 70 / barrel. Guar seed and Guar gum prices are down due to profit booking in the forward market. Guar gum is used in oil and natural gas industry for crude oil production. Crude oil prices are increasing due to production cut by OPEC countries. Crude has recovered approximately 8-9% during last week. US shale crude oil production is increasing its production to meet the global demand, while OPEC is decreasing the production to tighten the supply. It is a global crude war between two rivals group of crude oil production. It was also observed that stocks of oil drilling service provider companies are also up by 8-10%. These companies are getting enough cash for their operation from their customers. USA is ambitious to become the major crude oil producer inworld by overcoming Saudi Arabia and Russia. Geopolitics conditions are in favor of USA. After Gulf and Russia, other oil prodding countries are politically unstable and crude oil production is collapsing. Venezuela is facing economic sanctions and crude oil production has been collapsed. Libya, Iraq, and Syria are unstable. Investors are avoiding these countries. USA is the favorite destination for oil and gas investors. Guar gum prices are down in fear of oversupply in the market in the coming month. There is the pressure of profit booking in the forward market. This downward movement looks speculative. Fundamentally Guar seed and Guar seed is strong enough. All the fundamental price factors are positive. 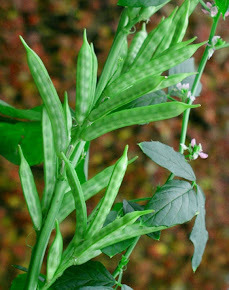 Guar seed production is limited. Guar seed supply is limited, this year Guar gum demand is higher than previous years. During last two months (January and February) Prices of Guar seed are stable above 4000 level. There are so many factors which are responsible for price movement. Even in the forward market, there is the open interest of 2,00,00,000 (2 crores) bags of Guar Seed. It means buyer and seller both are standing for this much of Guar seed quantity. From 16th Feb to 23rd Feb 2018, oil rig count has reached to 978 which is 3 rigs more than the previous week. AS per govt decision, govt will decide higher MSP of Kharif pulses than the previous year. This will lead to higher sowing area of Kharif pulses and lesser cultivation area of Guar Seed. Guar seed production will be lesser in next cropping season. As per global organizations, USA will lead in oil production in the year 2018. USA product crude oil with fracking technology. Guar gum is used as drilling chemical and gelling agent in the fracking process. Today Guar seed and guar gum price are stable in the local market. Good quality of guar seed is traded at Rs 4400/100Kg and average quality guar seed is traded at Rs 4200/100 Kg. Standard quality guar gum is traded at Rs 9500/100 kg. In interior location, guar is traded up to 4100/100 Kg. guar seed is being traded week in the future market. At NCDEX (National Commodity & Derivatives Exchange Ltd) guar seed-10MT is being traded at Rs 4274, 4281, 4310 lower by 0.11 percent or INR 4.5/100 Kg, 0.28 percent or INR 12/100 Kg, 0.34 percent or INR 14.5/100 Kg with the open interest of 106930, 73050, 4380 for March April and May month. Guar gum is being traded weak in the future market. At NCDEX (National Commodity & Derivatives Exchange Ltd) Guar gum- 5MT is being traded at Rs 9175, 9270 lower by 0.22 percent or Rs 20/100Kg, 0.29 percent or Rs 27/100 Kg, with the open interest of 45470, 31850, for March and April contract. Prices of guar seed and guar gum were down on Friday due to profit booking at the upper level in the future market. March contract of Guar gum and guar seed were closed at 9282/100Kg and 4298/100Kg. All the stack holders are uneasy with this sudden movement in prices. 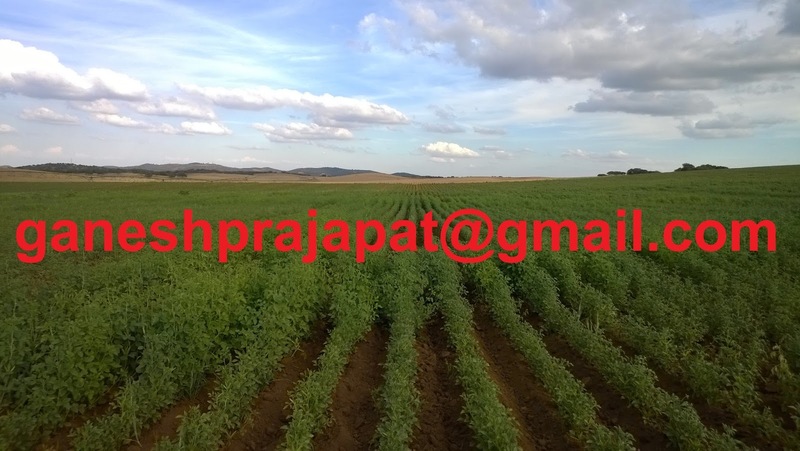 Guar seed is the major cash crop in guar gum growing belt. This is leading commodity of the future market. This is also the major commodity for driving the commodity business. Guar is a demand-driven commodity. The production also plays role in the price movement of guar seed and guar gum. The major demand of guar gum arrives from Shale oil and gas production industry. Currently, crude oil production from shale process is increasing regularly. US shale oil and gas production industry is enjoying the increasing crude oil prices. OPEC has decided to cut the oil production to control the falling prices. These price control measures initiated by OPEC and Russia are working. Last week Crude oil production in the USA hit the highest level of 10,271,000 Barrel Per Day. Crude oil prices have also improved in the USA. Brent crude oil is being traded around 67 USD/barrel. Shale crude oil production remains profitable above USD 60/barrel. Drilling activities are increasing in USA at current crude oil prices level. Oil rig count has also increased in this week. Stocks of oil drilling companies are gaining and giving the good return to investors. The current level of crude oil price is investor friendly, this is profitable for everyone. As per the demand of guar gum is concerned, it will increase with stable crude oil prices. Consumption of drilling chemicals is increasing with stable crude oil prices. AS per existing data this year guar gum export is 40% higher than last year until December. Export data for January has yet to be released by govt. As per market information, January export was also higher than the previous year. Fundamentally Guar is not week currently. Speculations are the different game. 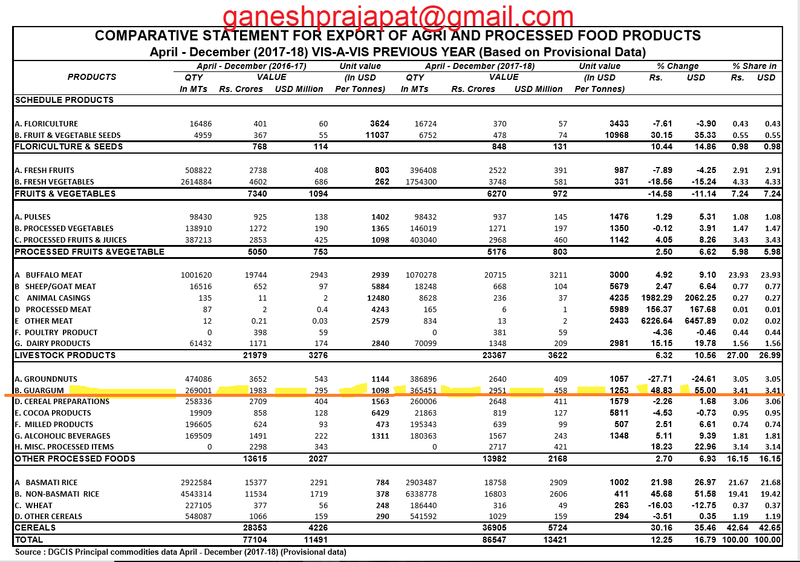 This year Gaur seed production was lower than the previous year. As per market information, there was the production of 70,00,000-80,00,000 bags of guar seed. Export of Guar gum is higher than the previous year. There gap between demand and supply. The new production of guar seed will come after 8 months. This year in Kharfi -2018 Sowing of guar will be low as Govt will decide higher MSP of Kharif pulses. Farmers will go for the sowing of Kharif pulses instead of guar as Pulses will be supported by the higher MSP. The flow of lower guar seed production will remain to continue even into next year. Supply of guar seed will be also poor even next year. Supply of guar seed will be limited. India is the only major producer of guar in the world and Rajasthan is the Major producer of Guar in India. Next year is the general election year. Govt will assist farmers in the form of MSP. Guar is grown in a limited geography, so guar seed is not a priority for Govt. As per fundamental conditions, Guar prices will bounce back from the current level. It will cross the level of Rs 5000/100Kg due to poor supply. Ready Guar seed is not available in the market. Peak arrival period of guar seed has ended. Monsoon prediction in My June will give another major prediction about guar prices. If the monsoon is predicted poor, then guar seed prices will get another boost. The current level of Guar seed and guar gum prices is not matching with demand and supply. Supply is restricted and Demand is increasing. Crude has recovered 10 % in comparison to last week. Impact of Crude will come in guar seed and guar gum prices. Guar churi Korma are performing very well and giving good support to Guar gum processing industry. It will keep supporting until Soybean prices remain high in the international market. 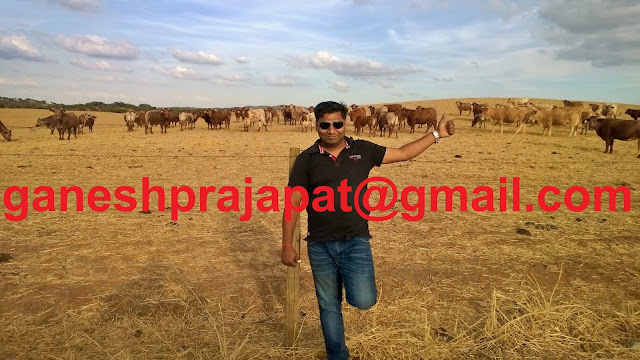 At this time all the fundamental for guar seed and guar gum are positive. Guar and Guar gum prices will rise with stable crude oil price. Crude oil prices are stabilizing in the international market above USD 60 / barrel. OPEC is limiting its crude oil production to strengthen the crude oil prices. The share of shale oil production is increasing with increasing crude oil prices. 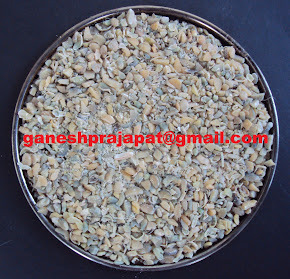 Guar is major Kharif commodity in western Rajasthan. Peak arrival period has been already gone. It is the time for the arrival of Rabi production in the market. Shale oil production is major guar gum consumption process. Guar gum is used for drilling chemical as a gelling agent. It is used to fix the proppant in the shale cracks after fracking process. Geopolitics conditions are improving. Political stability is coming globally. Industrial production is increasing in China and India. Demand is increasing from both the countries. As per information USA crude oil has reached to Indian Ports. Indian major guar gum production Group company Vikash WSP is entering at next level in the business of drilling chemical. 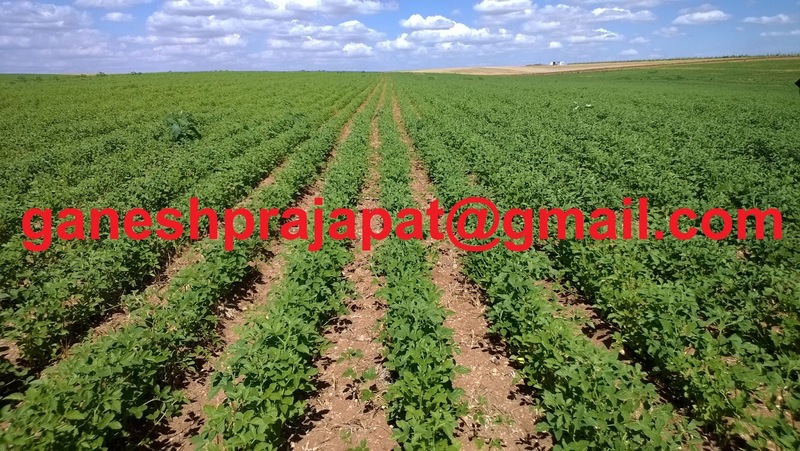 Another company of Vikash group by the name of VIKAS Granary is entering in the business of manufacturing of proppant in India. 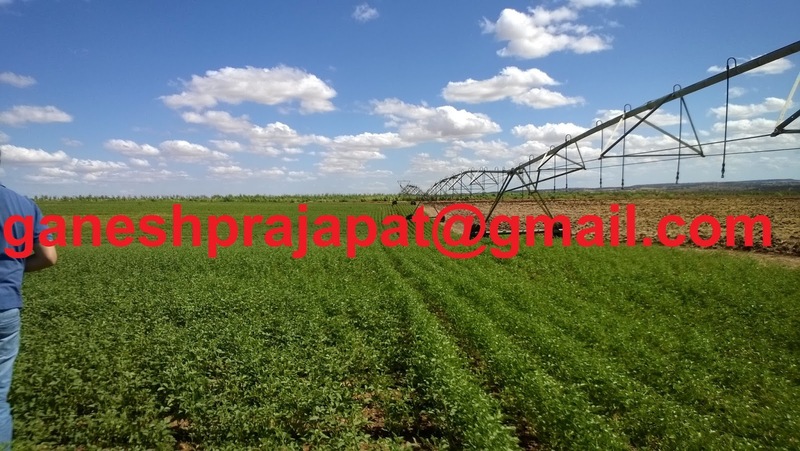 Vikash granary has granite mines they want to enter in the business of manufacturing of proppant. Proppant is big coarse size sand particle. This will a value-added activity for guar gum powder export. India will earn more from the export of mixture of guar gum and proppant. Guar seed and guar gum are strong in the local market. 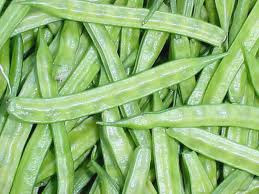 Guar seed and guar gum are quoted high in the local market. Future trading is also strong since last three days. Good quality of guar seed is traded at Rs 4500/100Kg and average quality guar seed is traded at Rs 4400/100 Kg. Standard quality guar gum is traded at Rs 9650/100 kg. In interior location, guar is traded up to 4300/100 Kg. guar seed is being traded strongly in the future market. At NCDEX (National Commodity & Derivatives Exchange Ltd) guar seed-10MT is being traded at Rs 4430, 4469, 4515 higher by 0.37 percent or INR 16.5/100 Kg, 0.3 percent or INR 13.5/100 Kg, 0.07 percent or INR 3/100 Kg with open interest of 149810, 41350, 3140 for March, April and May month. Guar gum is being traded strong in the future market. At NCDEX (National Commodity & Derivatives Exchange Ltd) Guar gum- 5MT is being traded at Rs 9655, 9790 higher by 0.64 percent or Rs 61/100Kg, 0.69 percent or Rs 67/100 Kg with an open interest of 60075, 16520 for March and April contract. Guar seed and guar gum price are moving parallelly with crude oil. Currently, Crude oil prices are the major driver for guar seed and guar gum prices. OPEC is trying to take prices of crude oil toward the upside, but USA shale oil production is enjoying the upward crude oil prices movement. This year international demand for Indian guar gum is also upward. Actual picture will come out with export data of January-18 data will come in market. As per IEA rig count in USA is increasing. The demand of guar will keep increasing with increasing rig count. Guar gum and guar seed prices are showing highly speculative movements in February18. Prices have fallen from its three-year peak point in February month. Guar seed and guar gum prices are showing recovery. Speculators are active in the market, so they are putting pressure on price movements. Traders and farmers are positive about major price gain in guar seed and guar gum this year. Last guar seed price rise was up to 4700/100Kg. There are possibilities that prices will cross 5000 level. 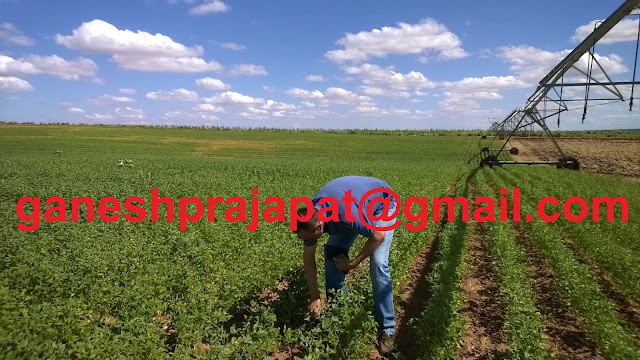 New production of guar seed will come after 8 months and the market will in demand condition due to increasing fracking activities in USA. There are strong possibilities that Central govt will increase the MSP of the Kharif pulses as current govt is focused on farmer’s welfare and will give monetary incentives to farmers. Contract of guar seed and guar gum has entered in March contract as February contract has finished at 4500/100kg, February contract was started around 3700/100Kg, thus February contract finished with 26% gain from its initiation price. Most of forward contracts of guar seeds and guar gum are being traded in March contract. Next 15-20 days will be very important and prices will move upward because the contract will settle around 20thMarch,2018. There is the big war between two major oil producer groups OPEC and Shale Oil. Both groups want prices upward. OPEC is trying to cut production to restrict the supply, but US shale oil is enjoying the upward price movement by supplying its crude oil production to major crude oil markets like China and India. The demand of guar seed will also increase with domestic demand of guar seed for sowing in summer / Kharif season in June - July. Guar gum demand will increase with increasing fracking Crude Oil production. Production of fracking oil Gas increasing in the USA. Prices of crude oil also started to go don from it the higher level of this year. Indian guar gum industry supplies fast hydration guar gum powder as drilling chemical to the fracking based crude oil production industry. 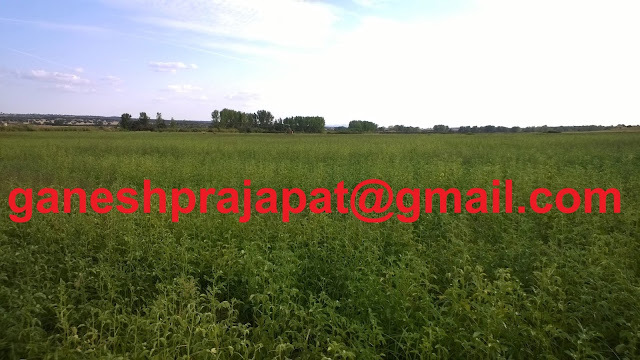 Prices of guar gum and guar were increasing with increasing crude oil production. Guar seed and guar gum traders are taking decreasing crude oil prices as a negative sentiment. Indian guar gum industry is coming under selling pressure with falling crude oil prices. Indian guar gum industry should take it positively. Prices are falling due to increase in production of fracking based crude oil. OPEC crude oil production is still stable and OPEC countries agree to cap on crude oil production. Russia is also part of that agreement. The USA is emerging as leading crude oil producer in the world. 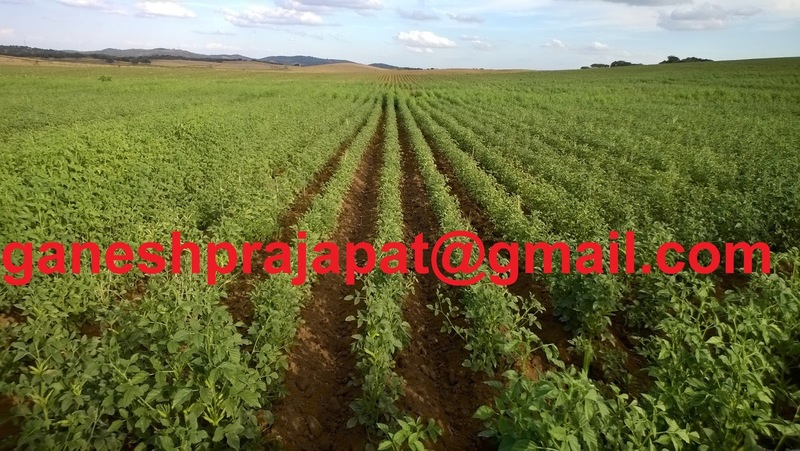 The demand for Indian guar will increase with these factors. If prices of crude oil fall due to increase in crude oil production by OPEC countries, then it can be a warning for Indian guar gum industry. The USA put a ban on crude oil export in the year 1975. The USA lifted this ban in the year 2015. Now the USA is aiming to become a leading exporter of Crud oil. Indian Guar gum industry should not come under pressure of current crude oil fall. OPEC countries are agreed to cut production till March-18. USA would like to use this time as opportunity and it will saturate the world crude oil market with USA crude oil. Indian guar gum industry should not react negatively too early with falling crude oil prices. The demand for Indian guar gum will increase with increase fracking based oil production. Currently, all the factors are positive for guar seed and Guar gum. The new production will come after 8 months, peak arrival period of farmer’s production also end, Production of guar seed is lower than previous years, export of guar gum is higher than the previous year. Export data of guar gum for January and February will come very positive. Indian guar gum industry will benefit from competition in OPEC crude oil production and fracking based crude oil production USA. In the year 2013 OPEC put the pressure on Shale oil production by increasing the production. This time Shale oil crude production will put pressure on OPEC. Because the financial position of OPEC is not good enough to do competition with Shel crude oil. Except for domestic figures, Guar will benefit from this competition. Guar seed and guar gum are sluggish in the market. Guar seed and guar gum price are stable in the future market local market. Guar seed and guar gum business under pressure. Major pressure is coming from falling crude oil prices. Crude oil prices are down due to overproduction of shale crude oil. Crude oil prices are falling but oil companies are positive about growth in near future. Guar seed and guar gum traders are in the wait and watch condition. Prices of Guar seed and guar gum are stable since last Friday. These 4 days were very important after four days fear market opened today and Guar seed and guar gum prices remained stable after the pressure of cure oil prices. The arrival of Guar seed in physical market is still very poor. A per marketmen per day arrival of guar and guar gum is around 15,000 Bags. Traders and farmers are confused due to falling crude oil prices. As per expert, this is a positive sign that crude oil prices are falling due to overproduction. Guar gum exporters are waiting for the price rise of crude oil. After a regular fall in crude oil prices, today prices are stable. There are no any major expectations of sudden crises in Guar seed and guar gum prices as new arrival will come after 8 months. Existing stock of guar Guar seed and guar gum has already stored in warehouses. Within one or two downfalls, the stored Guar seed and guar gum will not come out. Stability in Guar seed and guar gum prices are more important than prices rise. Even if the prices of crude remain stable at current level then drilling will continue in USA and demand of guar gum will keep going. Existing statics are positive for Guar gum export trade, export value and export quantity of guar gum are higher than previous years. Major traded of Guar seed and guar gum in the future market has shifted to March contract. Guar gum is being traded strongly in the future market. At NCDEX (National Commodity & Derivatives Exchange Ltd) Guar gum- 5MT is being traded at Rs 9817, 9944, 10076 higher by 0.14 percent or Rs 14/100Kg, -1.15 percent or Rs -2/100 Kg, 0.15 percent or Rs 15/100 Kg with open interest of 2435, 75285, 3315 for February, March and April contract. Good quality of guar seed is traded at Rs 4500/100Kg and average quality guar seed is traded at Rs 4400/100 Kg. Standard quality guar gum is traded at Rs 9800/100 kg. In interior location, guar is traded up to 4300/100 Kg. guar seed is being traded strongly in the future market. At NCDEX (National Commodity & Derivatives Exchange Ltd) guar seed-10MT is being traded at Rs 4481, 4512, 4564 higher by 0.46 percent or INR 21.2/100 Kg, 0.33 percent or INR 15/100 Kg, 0.4 percent or INR 18/100 Kg with open interest of 32680, 174560, 18760 for February, March and April month. Guar and Guar gum prices movement. Last month (January-18) was very good for Guar and Guar gum. Guar seed and Guar gum got good support from increasing crude oil prices. Prices of guar seeds reached up to 4700/100Kg. During the first week of February prices of guar seeds crashed with falling crude oil prices. It has reached to 4505/!00Kg. There is around 5 % fall within the week. Exporters, Traders, and farmers are worried about this downward movement. If prices reached from 3500 to 4500 it is ok, but if prices decrease from 4700 and reached to 4500 defiantly it makes worries to anyone. What does falling crude oil means? People are trying to put Guar and crude in the same track. It not always true. When the prices of crude oil were increasing then there was demand. New oil drilling started with increasing crude oil prices. Guar was used in that activities result of the same in front of us. Inventory of crude oil has increased. That’s why prices of crude oil are down. Here it is clear that there is the demand that’s why oil drilling companies have increased the production. Crude oil prices are down due to increased shale oil production. There is no role of OPEC. OPEC has agreed to cut down its production till march and at next level negotiation OPEC want oil cut extended up to end of 2018. If prices of crude fall, then it is an indication that Guar gum is being used in shale oil production. It not an issue of concern. How will MSP of Kharif pulses impact Guar? This was the last budget prepared by current BJP Govt. BJP will have to face election in March 2019. Before election BJP will give some financial benefit to farmers. MSP is one of the best ways to assist farmers financially. Rabi season is going on. It is not taken widely through our country but Kharif or summer season crop is taken throughout the country. Govt will declare increased MSP of Kharif pulses. In Guar growing belt Moong moth are major Kharif pulses. If the MSP of Moong is kept around 6000/100Kg and Guar prices will remain below 5000 then farmers will not go for Guar cultivation. There are maximum possibilities that govt will announce good bonus on Kharif pulses. If the sowing of Guar will remain lower, then prices will increase before the arrival of next crop in November-2018. As per marketman, last year stock is around 80,00,000 Bags. This much of quantity always remain in the market. This year production figure is also same which is around 80,00,000 Bags. Like previous year quantity, Stock of Guar always remains with farmers, stockist, and millers. The current arrival of guar seeds is around 17000 bags per day. But 70 % material is coming from last year stock, this year crop produce is laying with stockist, traders or big farmers. It will not come till next crop arrival even if the prices reach to 6000. This year material has reached in warehouse sat initial stage at a lower price around 3300/10kkg. This stock will not come out even the prices crushed downside below 4000. Export of Guar gum is around 40 % higher than the previous year up to December 2017. It is expected to remain higher during rest of year in comparison to last year. Export of Guar has also high in January month actual data will come in March month. As per exporters, there was good export during January month January. 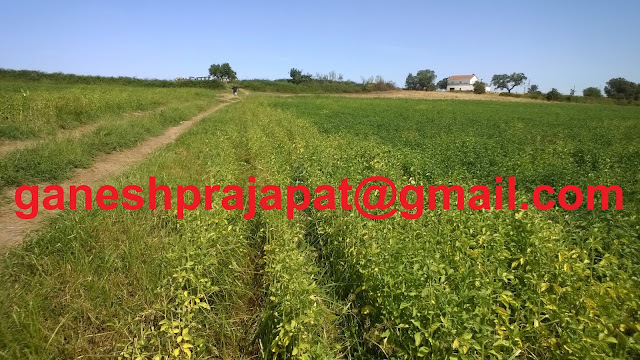 IF the early prediction of monsoon remains poor then prices of Guar will increase. If it remains normal and good, then prices of that time will keep going. As per primary inputs monsoon is expected to remain poor. The arrival of first rainfall in May June will be also a crucial factor. Farmers need not worry. Over prices of Guar has gone up in this season. It is poor supply period peak arrival period from farmers has already gone. As per industry experts, oil rigs are increasing continuously in the USA. It is very positive news for Indian Guar gum industry. The demand of Guar gum powder will increase. Farmers or traders must keep in mind that this year production is lower than the previous year. The demand of Guar gum is also very high. Export of Guar gum is also higher than previous years. Prices of Guar and Guar gum is also increasing. The new crop will come after 8 Month up that time existing stock will be used. MSP of Kharif pulses is expected to remain high. Crude oil prices are going down due to the production of Shale crude oil. Guar sowing area will come down due to higher MSP of Kharif pulses. Oil rigs are increasing in the USA. Most of the factors are positive for future growth of Guar and Guar gum price. As per Energy Information Administration (EIA) Currently USA, crude oil production is around 10.25 Barrel per day. It is expected to rise by 11.2 Million Barrel per by the next year. This year Guar arrival as started at Rs 3300/Kg. Generally, 2Nd and 3Rd week remain under pressure. Price will not always move in one direction only. The physical market is strong due to stock at lower level and market fundamentals are also strong behind guar price. Export value of Guar Gum products has increased by 55 % in year 2017-18. 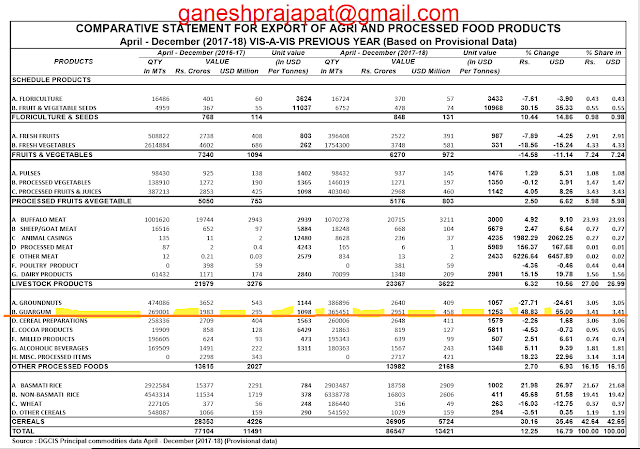 As per primary data released by APEDA export value of Guar gum has increased by 55% . This year Guar gum export from April-17 to December-17 was 3,65,452 MT. Last year in the same period April-16 to the December-16 export of Guar gum was 2,69,001 MT. There is an increase of 96,451 MT or 35.85 % in quantity of Guar gum products for the period of April- December. Last year from April-16 to December-16, we exported Guar gum, values of INR 1983,00,00,000 (1983 crore) or 295 Million USD, for the same period during this year from April-17 to December-17 India exported Guar gum value of INR 2951,00,00,000 (2951 Crore) or 458 Million USD. Last year from April-16 to the December-16-unit value of Guar gum export was 1098 USD/MT this year for the same period from April-17 to the December-17-unit value of Guar gum export is 1579 USD/MT. In Indian rupees, this is an increase of 48.83% INR and in USD it is an increase of 55%. Only in December -17 months there was an export of 43,880 MT of Guar gum. Export of Guar gum expected to increase with increased crude oil prices. Crude oil prices have increased during January month. Oil companies in USA have increased the production of crude oil through hydraulic fracturing/fracking process. Prices of crude oil are low due to increased oil production. One thing is positive that crude oil prices are decreasing due to increased Shale crude oil production in the USA, not from OPEC production. The demand for Guar gum will keep going with the current level of crude oil prices. Oil companies have earned enough margin to continue their crude oil production. Indian Guar gum industry should take it positively that if production of crude increased in USA then it is good for Guar gum. If production increases from OPEC, then it would have forced USA crude oil to stop. China has emerged as leading importer of crude oil. This is direct competition between OPEC crude oil production and Shale crude oil production. Shale crude oil production is winning slowly and slowly. Prices of Guar seed and guar gum price are sluggish and downward in the forward market due to falling crude oil prices. Guar seed and guar gum price are stable in spot markets. Crude oil price is falling in the international market due to increase inventory of crude oil in USA. Impact of the same is disturbing the upward movement of Guar seed and guar gum price. Marketmen as associating crude oil price fall with increased inventory. Leading market research and monitoring organization Goldman Sech is telling the different story. As per Goldman sech prices of crude oil will cross USD80/barrel level with in 6 months. As per market information falling of crude oil is happened due to some external factors, it has not dropped due to internal factors of oil industry. There are downward movement in financial markets. impact of the same leaded to crude price fall. Arrival of Guar seed is still very poor in local markets. It may increase with weeklong price fall. But there are lesser possibilities that guar seed will come in market. Guar Churi Guar Korma is still very strong in market. It is being traded. One of leading exporter Guar products is exporting good quality PP bag packed Guar korma with base price of 2900/100Kg. Other cost of related to export and packing are extra. Guar seed and guar gum price are performing better than expectations. February expectation was 4500/100Kg but guar seed is performing far better than that. Good quality of guar seed is traded at Rs 4650/100Kg and average quality guar seed is traded at Rs 4600/100 Kg. Standard quality guar gum is traded at Rs 10300/100 kg. In interior location, guar is traded up to 4300/100 Kg. guar seed is being traded week in the future market. At NCDEX (National Commodity & Derivatives Exchange Ltd) guar seed-10MT is being traded at Rs 4512, 4576, 4630 lower by 1.14 percent or INR 52/100 Kg, 1.06 percent or INR 49/100 Kg, 1.19 percent or INR 56/100 Kg with open interest of 84120, 151410, 16500 for February, March and April month. Guar gum is being traded weak in the future market. At NCDEX (National Commodity & Derivatives Exchange Ltd) Guar gum- 5MT is being traded at Rs 10162, 10320, 10448 lower by 1.21 percent or Rs 123/100Kg, 1.15 percent or Rs 118/100 Kg, 0.46 percent or Rs 48/100 Kg with open interest of 13110, 65740, 1575 for February, March and April contract. Guar seed and guar gum price, there is no any major concern. Price don’t move one direction for long time. Guar seed price will cross INR 5000/100Kg level in February. Whole financial market is in down word trend. Guar seed and guar gum price are kept growing. Guar seed and guar gum price are getting the boost from export demand. Processing companies are buying guar at upper prices. With increasing drilling activity in USA, the demand for guar gum powder is increasing. Export orders of Guar and Guar gum have started to reach to Indian guar gum industry. Prices are growing. Big Processors are hedging their orders in NCDEX and booking their guar seed and guar gum split. Crude oil prices remained stable but lower than USD70/ barrel. There is news that Russian has cut down its crude oil production. It will give stability to oil prices. USA is slowly and slowly increasing its international crude oil export share. As per Goldman Sachs, crude oil will cross the level of USD 80/barrel within 6 months. Within 3 months oil will cross the level of USD 75/barrel. Indian guar gum industry will benefit from it. Oil drilling activities will continue during this crude oil price rise. Good quality of guar seed is traded at Rs 4700/100Kg and average quality guar seed is traded at Rs 4500/100 Kg. Standard quality guar gum is traded at Rs 10300/100 kg. In interior location, guar is traded up to 4300/100 Kg. guar seed is being traded strongly in the future market. At NCDEX (National Commodity & Derivatives Exchange Ltd) guar seed-10MT is being traded at Rs 4671, 4735, 4799 higher by 0.26 percent or INR 12/100 Kg, 0.33 percent or INR 15.5/100 Kg, 0.39 percent or INR 18.5/100 Kg with open interest of 96610, 134720, 15870 for February, March and April month. Guar gum is being traded strongly in the future market. At NCDEX (National Commodity & Derivatives Exchange Ltd) Guar gum- 5MT is being traded at Rs 10326, 10497, 10621 higher by 1.28 percent or Rs 130/100Kg, 1.29 percent or Rs 133/100 Kg, 1.35 percent or Rs 141/100 Kg with open interest of 18030, 63385, 1045 for February, March and April contract. The arrival of guar is below 20,000 bags per day. The market is crazy for 5000 level. Farmers and traders are waiting for Rs 5000/100Kg level. Guar Churi korma is also strong due to upward movement in soybean. 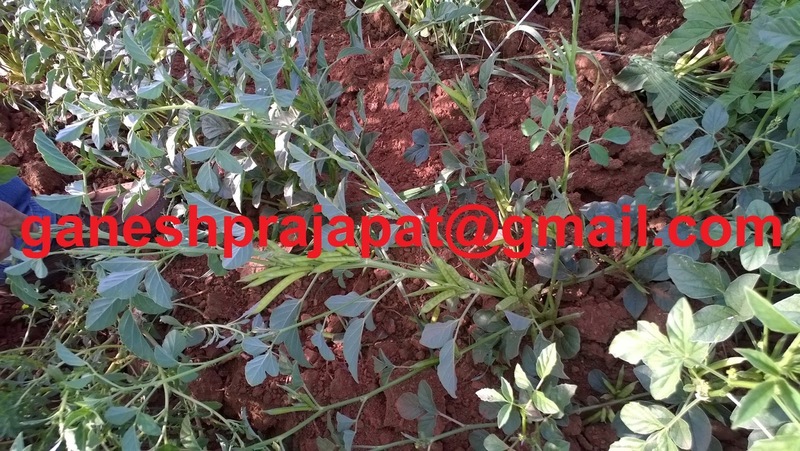 The physical market of guar is very strong. Strong buying has noticed in physical market at upper prices.